WASHINGTON -- Even as consensus built within the Federal Reserve in June about the likely need to begin pulling back on economic stimulus measures soon, many officials wanted more reassurance the employment recovery was on solid ground before a policy retreat. Financial markets have largely converged on September as the probable start of a reduction in the pace of the U.S. central bank's $85 billion in monthly bond purchases, but minutes of the Fed's June meeting released on Wednesday suggested that might not be a sure bet. "Several members judged that a reduction in asset purchases would likely soon be warranted," the minutes said. But they added that "many members indicated that further improvement in the outlook for the labor market would be required before it would be appropriate to slow the pace of asset purchases." 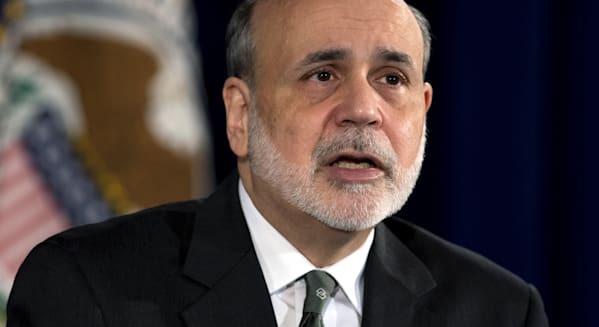 Global investors have recently recovered from a mild bout of panic that followed Fed Chairman Ben Bernanke's road map for an end to so-called quantitative easing, which he said would likely draw to a close by the middle of next year. Financial market fears have been allayed in part by a chorus of Fed officials who have sought to reassure traders that the end of asset buys will not lead to imminent interest rate hikes. "Many members indicated that decisions about the pace and composition of asset purchases were distinct from decisions about the appropriate level of the federal funds rate," the minutes said. Whether the markets have gotten the message isn't fully clear; the yield on the 10-year U.S. Treasury note has risen a full percentage point in just two months and stands close to its highest levels since 2011. This has already slowed activity in the mortgage market, which had been key to the recent economic rebound. At their June meeting, some Fed officials worried not only about the outlook for employment, but the pace of economic growth as well. Many economists believe the economy grew at less than a 1 percent annual rate in the second quarter, although most look for a pick-up in the second half of the year. "Some [officials] added that they would ... need to see more evidence that the projected acceleration in economic activity would occur, before reducing the pace of asset purchases," the minutes said. Of the Fed policymakers who argued it would be wise to curtail bond purchases soon, two thought it should be done "to prevent the potential negative consequences of the program from exceeding its anticipated benefits." So you're seeing a lot of strength in housing, and it's coming from almost every place geographically ... So that's sort of the big winner. Auto and that whole complex is a big winner. They're doing over 15 million cars this year, up from 8.5 at the bottom. And then you have the energy complex, which is really, really a revolution. This is hard to underestimate the impact of energy and all the natural gas that's being produced and all the subsidiary types of things that come from that activity. And if you add on top of that, technology which is still a very big pocket of strength and quite robust in the United States, you've got some really good stuff happening. On the other hand we do have the U.S. government at work, trying to decrease growth as rapidly as they can. And so they've, unfortunately, had some success in that area, and that leaves us somewhere in the 2%-plus area. We think that the next big risk in the industry is rising interest rates. And so we're very focused on what happens when interest rates return to a more historically normal level. On the positive side, economic fundamentals in the United States continue to improve. The main impediment to growth appears to be the speed and nature of the withdrawal of fiscal stimulus. Debate has actually now opened up on how and when to withdraw some of the monetary expansion. All of this is very good news. At the same time, the rest of the world looks no stronger. Europe is mired in a recession, Asian growth seems more modest and Japanese attempts to restimulate their economy through monetary stimulation have set off further downward pressure on interest rates and currency values. The overriding driver of recovery in the housing market remains the underproduction of both single and multifamily product throughout the economic downturn and up to and including this year. Over the past 5 years of housing production, we've built an average of under 700,000 single and multifamily homes total per year, with an average obsolescence rate of approximately 300,000 per year. This compares to a need for new dwelling units per year of between 1.2 million and 1.5 million. This year, a significantly stronger year of building activity, we will produce approximately 950,000 single and multifamily dwellings, and again, will underserve the country's needs. We have more than absorbed the overbuilding of the early to mid-2000s, and have been underproducing for a protracted period of time. This shortfall will have to be made up, and the builders of both multi and single-family products have been pushing to increase production. I think when you look at some of the economic indicators, housing starts are up, prices are up on housing. I think housing is a really important measure for us because we have a lot of jobs around that. A lot of contracting roofers, et cetera, around that. All of that is positive. And so we're feeling like we're coming off the end of the year with some momentum, and that will certainly help us. I think there's reason to be very optimistic when you consider that demographic tailwind that will continue over the next 5 to 10 years, certainly. And then when you think about just the economy itself and you look at the strength of the balance sheets of consumers and corporations, the amount of liquidity out there, combined with the depth of the housing correction, I think there's a good argument we made that the housing cycle we're in right now will be strongest of the last 3 that we've seen. Although we have seen recent improvements in the U.S. economy, growth is relatively light and confidence remains fragile. In addition, while the market generally feels better about the tail risk in Europe, the economy is challenged. Given the continued uncertainty in the market, we are not managing the firm with the hope that the macro backdrop will improve. We are focused on managing through a continued difficult operating environment. We continue to be very concerned about the prospects for the financial markets and the economies of North America and Western Europe, accentuated by potential weakness in China. There continues to be a big disconnect between the financial markets and the underlying economic fundamentals. Markets are firming. If the economy continues to expand like it is, I think you'll see the banks loosen up. And if sort of rates go up a little bit but underwriting loosens up a bit, I think you'll see similar demand, if not more. That's why we're not troubled by a little uptick in interest rates right now. The situation in Europe is not even slightly better. It's probably slightly worse. Even if we do not have a Greece event, if you will, the environment is moving from an economic standpoint to recession. And so the mood with our clients over there is still to be thoughtful and to be very mindful about the way they invest. And when clients are thoughtful and mindful, they tend to wait a little bit more and to think further on when and how much they're going to invest. "I think the whole thing about the 2% extra payroll tax wasn't helpful. Don't forget, in America, the average household makes $50,000. 2% is $1,000 a year. I mean, after tax, that's a hurt in their pocketbook. Gas prices have been going up. I -- and you've seen the retailer results, the Walmarts, Kmarts, Targets, Costcos of the world had, had results less than they expected, not very good. So it's weak. I don't think it's -- I'm not ready to declare it's a permanent decline or a second dip on the recession there, but it's a little nervous as far as what's going on up there." We're really proud now that the [government budget] deficit could only be $600 billion in the year, and while that's encouraging, it doesn't do anything to fix the long-term problem, and the long-term problem is entitlements. If you take a look at the Medicare and Medicaid in particular and some on Social Security that while debt as a percent of GDP is we'll say around 75% today and under the new estimate grows to 83% by the end of the decade ... You take those same numbers, go up to the next decade and it goes to 135% debt as a percentage of GDP largely driven by the baby boomer generation retiring which no politician, Republican or Democrat, really wants to talk about. They're more than willing to say we got to reform entitlements but as soon as you say well, like what, that's when they all start to back off because they don't want to anger the voters. I think there's a lot of concern about central banks not just in the U.S., China elsewhere, and maybe they stretched themselves out, and they played this maybe game, you want to call it for quite a while and maybe they are getting a brick wall, and the days of easy and free money may be coming to an end or at least maybe tapering off. But it probably wouldn't be good [for the global economy in the short-term], maybe good for long-term because then it would be more based upon fundamentals rather than speed injections.